A couple of mundane financial figures speak volumes about the future of Missoula. Two pieces of land were put up for auction recently, one large 500-acre tract about 8 miles out of town and one smaller piece of real estate zoned for mixed-use near downtown. The downtown piece sold for $1.8 Million, over six times its previously assessed value. The nice big piece of potential sprawl did not even meet it's asking price of $10.4 million. It was not sold. In the recent issue of the wonderful new magazine Missoula.com, Micheal Moore wrote a feature article about the resurgence downtown has seen in the last twenty years. (Curiously, I can't find the article online). Downtown has seen boarded-up storefronts gradually morph into boutique shops, an attractive waterfront, and new residential growth. This trend shows no sign of stopping. Change will be inevitable and quick. The challenge for Missoulians will be to get out in front of these changes to ensure that they reflect our community's value system. Will all housing be high end? Will national franchises flush out the local businesses? Will pedestrians and cyclists be prioritized over accommodating more automobiles? What form will transit take? What sustainable practices will be utilized? Fortunately, attempts to address these issues are already underway, and not a moment too soon. 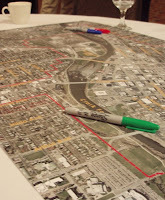 The Portland-based planning firm Crandall & Arambula held their first public workshop last night to help us though this process. - There should be a downtown "living room," a cultural epicenter of the city where public events can be held. - Pedestrian and bicycle routes cannot be disconnected. Good circulation is essential, especially along the riverfront corridor. - National chains can help anchor downtown retail, but if they comprise more than 10% local authenticity suffers. - A convention center is not a silver bullet. It should be a top-tier center if it is built at all, and the planners do not believe we are there yet. - Financing can come first through some exciting catalyst projects. $1 of public investment should yield $6 of private investment. - There has to be a provision of affordable "workforce" housing along with market rate housing. Likewise, there needs to be plenty of retail that regular Montanans would use. - Attention should be given to the gateways at the edges of downtown. - Better street lighting, more residential units, and a downtown police department would enhance safety. - There needs to be a streamlined process for cooperating with local government. - Consider whether developments are senior-friendly, child-friendly, and attractive to young investors. - Urban agriculture and rooftop gardens could become an asset in the near future. - Historic buildings, each reflecting the style of its time period, need to be preserved. - Install a street car system with fixed rails. Lots of ideas! The next step will be to develop a hierarchy of priorities and work toward a plan that has a fighting chance of being implemented.